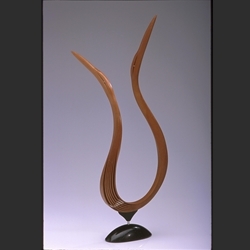 The sculpture Rendez-vous in cherrywood is a custom order, hand made in bent wood. A waiting period of one month is usually needed for the artist to create a work very closely resembling this image. Please inquire about pieces of a similar size that may currently be available. We will forward you photos of possible choices.